Soft mattress pads that can be removed, recliner, exterior stain, 1080p HDTVs, Charter Cable/High Speed Internet, two sleeper sofas, driveway repair and HVAC system. In order to rent our cabin you must be at least 25 years old and must be staying at the cabin the entire duration of your booking. If you have any other questions about price or minimum stay requirements, please contact owner at 313 530-5856. We might not be able to always answer immediately, but please leave a message or text as it's easier for us to get back to you quicker that way. Don't let the low price fool you. This is a great cabin at a great price and just the right place to unwind and put yourself miles away from all the stresses life throws our way. Heavenly Heights is an upscale designed three-level log cabin with three bedrooms and three bathrooms, 3 level wooden spiral staircase, a separate game room and a hot tub which accommodates 2 adults or 4 children. This log cabin is located about 2 miles from the Sevierville Convention/Events Center, 2.5 miles from Eagles Landing Golf Club (which is an 18-hole par-72 championship course), and about 1 mile from the new Wahoo Zip line (and yes, it is indeed the largest Zip line in the U.S.A), the Smoky Mountain National Park, and historic Gatlinburg are all within a 30 minute drive. Pigeon Forge has the Island which is home to Ol' Smoky Moonshine, Paula Deen's restaurant, Jimmy Buffet's Margaritaville, and the new Alcatraz Museum among many other cool activities. Please note: The spiral staircase is the only way to move up and down in the cabin. For those with mobility/medical/health issues, the main level provides easy access in/out of the cabin. The top loft and bottom floor are accessible only by the spiral staircase. For the sports fans in your group, the Chicago Cubs AA affiliate (Tennessee Smokies) is about a 20 minute drive due north in Kodak and the University of Tennessee Volunteers football team plays their home games less than 30 miles to the west in Knoxville. Hideaway Ridge has paved roads along with curbed and guttered streets for safe access. 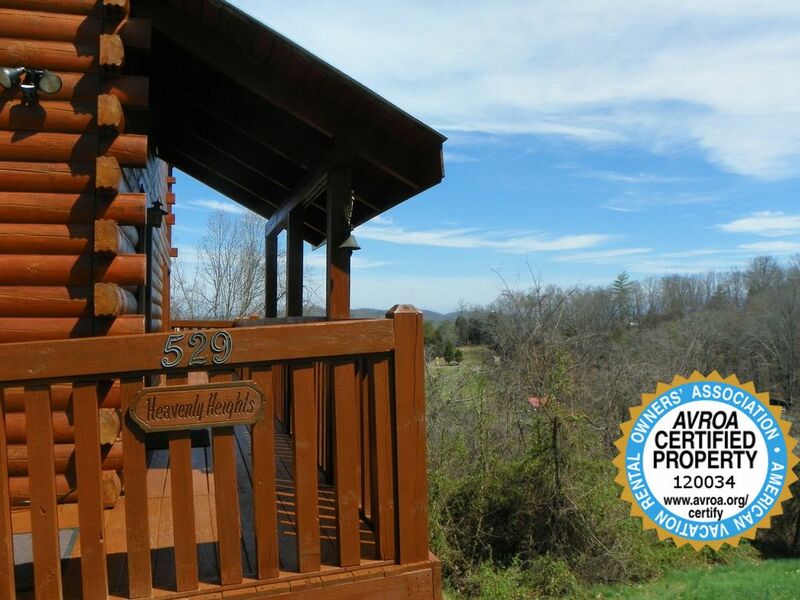 Our log cabin is furnished with log furniture and is situated with the convenience of being a few miles to Sevierville, Pigeon Forge, and Gatlinburg. This is a great place for those looking for relaxation and enjoyable scenery while still being close to all the excitement of the area. Please be advised that carpenter bees are a matter of fact in the Smoky Mountains and are especially active in March and April. They are rather large, but the male cannot sting. However, they are large and can be scary looking and are only around to protect the female, but they do not attack. The cabin receives regular treatments from a local exterminator that keeps them under control. While there’s no way to eradicate them, they will not bother guests. Here’s a good article from Penn State about them (https://ento.psu.edu/extension/factsheets/carpenter-bees). The main level has a Living room area with sleeper sofa, HDTVs and high speed internet (wi-fi), cable TV, great mountain view, and a double faced fireplace, which can also be viewed from the bedroom. The fully equipped kitchen with Microwave and Dishwasher has everything you would need to make any type of meal. The dining area seats 6. The main level bedroom has a Queen log bed, antique armoire, HDTV, fireplace with privacy screen, and full bath. The Huge Top Floor Open Loft area (720 square feet) has an open bedroom with King log bed, sleeper sofa, HDTV, romantic Jacuzzi tub, enclosed full bath, lots of glass to enjoy the mountain views and a private deck with two Amish rocking chairs for two, offering a spectacular view in the morning and at sunset. The Lower Level has a game room with custom pool table, log table with benches, HDTV, and wet bar. A closet area which holds the full size washer and dryer. There is a comfortable sitting area with futon couch, and stools around the custom pool table. The lower level bedroom has a Queen log bed, armoire, HDTV and full bath that adjoins the bedroom and game room. This deck also has a pair of Wooden Rocking chairs. Heavenly Heights also provides a parking area for at least 3 vehicles and a charcoal grill has been provided for your enjoyment. Keywords: Log Cabin, mountains, hot tub, pool table, 3 bedrooms, 3 baths, Three Level, wi-fi, high speed internet, HDTVs. My wife and I purchased this beautiful cabin in 2014. The Smokies are one of the most wonderful gems of the country and we love spending as much time as we can here. Our 3 level cabin has a bed and bath on each level (1 king and 2 queens in addition to 2 futons). The cabin is conveniently located about 5 minutes from the Parkway. What makes our cabin unique is it's 3 minutes from the heart of Sevierville, but feels like you are a world away from the hustle and bustle of the strip. We also offer free high speed WiFi and Charter/Spectrum Cable on HDTVs for those who need to stay in touch with very fast internet or want to enjoy great TV programming after a long day enjoying all the area has to offer. Landline phone provided. Free calls within the continental United States and Canada. Very relaxing, very clean, well stocked cabin. Enjoyed our stay and would stay again in a heartbeat. The cabin was nicely and appropriately appointed for the area. It is obvious it has been well cared for. We didn't try out the hot tub but the rooms were nice. The views especially early in the morning were fantastic. The location was right in the middle of Sevierville and not far from just about anything you would want to do. We would definitely stay here again. Owners communication was great as we were late getting down there. Was a little hard to find in the dark as we couldn't see the house number and ended up driving around the block once. Great location and lots of room! This place is great! It was very clean. The beds were comfortable. The house is large enough for a group, and everyone has their own space. The location is great! Lots of backroads to avoid major roads when traffic was bad. We were there for a cheer competition at the convention center. It was only about a 9 minute drive! Highly recommend! Thanks so much for your review Lori. We're so glad to hear everything met your approval and we'd welcome you back any time! Thanks again. Alan. Many more pros than cons. Nice location, very clean, great view. The issues were minor, but beds very hard, no garbage bags, aged furniture, and fireplace gas line odor (just shut it off). But overall a great place, thanks for sharing. Thanks for the review Russ. We are in the process of replacing some of the furniture you're referencing and will be adding mattress pads so renters can use or remove them depending on their preferences. We appreciate you taking the time to provide us feedback. Alan. We stayed in December and loved it. The cabin was VERY clean on all three levels. It is close to everything. The kitchen had everything I needed to cook for 5 people. Loved having the washer and dryer and the hot tub. The beds were harder than mine but the one on the lower level was soft enough for us to sleep good. Loved the 3 bathrooms so that everyone could get ready at the same time. It is beautiful cabin and a great price! Thank you very much for taking the time to give us your feedback. We take great pride in the cabin's cleanliness and appreciate hearing from you. So glad you got to enjoy time in the Smokies during the Christmas Season. Thanks! Alan.